Virtually all internet users rely on a quiet little device. At the most basic level, a modem sends and receives data between two computers. More technically, a modem is a network hardware device that modulates one or more carrier wave signals to encode digital information for transmission. It also demodulates signals to decode the transmitted information. The goal is to produce a signal that can be transmitted easily and decoded to reproduce the original digital data. Modems can be used with any means of transmitting analog signals, from light-emitting diodes to radio. A common type of modem is one that turns the digital data of a computer into modulated electrical signals for transmission over telephone lines. It is then demodulated by another modem at the receiver side to recover the digital data. Modems can also be categorized by the amount of data they can send in a given unit of time. This is usually expressed in bits per second ("bps"), or bytes per second (symbol B/s). Modems can be classified by their symbol rate, measured in baud. The baud unit denotes symbols per second or the number of times per second the modem sends a new signal. News wire services in the 1920s used multiplex devices that could technically be called a modem. However, the modem function was incidental to the multiplexing function. Because of this, they are not commonly included in the history of modems. Modems really grew out of the need to connect teleprinters over ordinary phone lines instead of the more expensive leased lines that had previously been used for current loop-based teleprinters and automated telegraphs. Digital modems came about from the need to transmit data for North American air defense during the 1950s. Mass-production of modems in the United States began as part of the Sage air-defense system in 1958 (the year the word modem was first used), which connected terminals at various airbases, radar sites and command-and-control centers to the SAGE director centers scattered around the United States and Canada. SAGE modems were described by AT&T's Bell Labs as conforming to their newly published Bell 101 dataset standard. While they ran on dedicated telephone lines, the devices at each end were no different from commercial acoustically coupled Bell 101 and 110 baud modems. In 1962, the first commercial modem was manufactured and sold as the Bell 103 by AT&T. The Bell 103 was also the first modem with full-duplex transmission, frequency-shift keying or FSK and had a speed of 300 bits per second or 300 bauds. The 56K modem was invented by Dr. Brent Townshend in 1996. 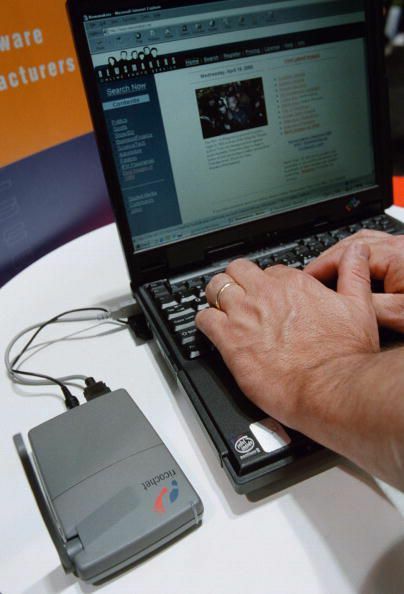 D​ial-up Internet access is declining in the U.S. Voiceband modems were once the most popular means of accessing the Internet in the U.S., but with the advent of new ways of accessing the Internet, the traditional 56K modem is losing popularity. The dial-up modem is still widely used by customers in rural areas where DSL, cable or fiber-optic service is not available or people are unwilling to pay what these companies charge. Modems are also used for high-speed home networking applications, especially those using existing home wiring.